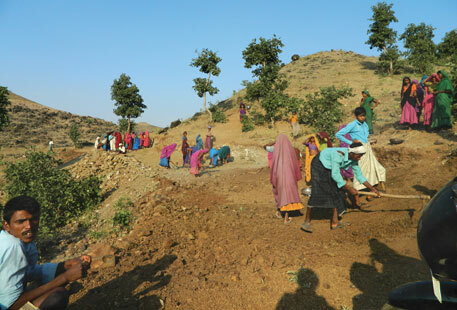 India’s rural development programmes are in for an overhaul. After the approval of the 12th Plan by the National Development Council (NDC) on December 27, 2012, the government has started restructuring of the behemoth called Centrally sponsored schemes (CSSs). In the Plan (2012-17) the Centre has committed Rs 541,276 crore for CSSs covering rural development, the highest ever budgetary support. The 12th Plan recommends bringing down the number of CSSs and giving states a major say in their implementation. Though such demands have been made consistently in the past 45 years, this is the first time a concrete step has been taken to prune the ever-increasing number of schemes. A revenue-strained Union finance ministry just sniffed an opportunity to bring in some fiscal discipline. The changes will be reflected in the budget for 2013-14. Going by officials involved in the budget preparation, the government may cut the current 147 schemes to 59. 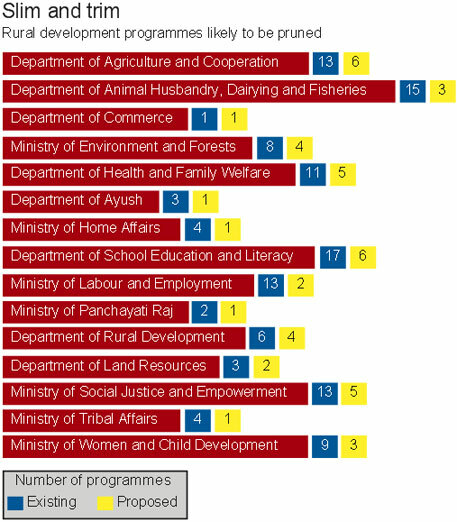 Of the 24 CSSs directly related to rural development, 11 may be retained, including the nine flagship programmes. Last year, a high-level committee headed by B K Chaturvedi, member of the Planning Commission, submitted a report suggesting such changes. The Centre is set to accept another recommendation of the committee: wind up schemes with annual outlay of less than Rs 100 crore. Of the six CSSs under the rural development department, four will be retained, while the District Rural Development Agency and the Provision for Urban Amenities in Rural Areas may be done away with. During the two-year-long consultation for the 12th Plan, it became clear that the money spent on programmes could not bring about much change in the living conditions of rural communities. This was because many schemes were implemented in isolation and did not give importance to local needs. What’s more, states, including those ruled by the Congress, have been demanding more say in the way CSSs are implemented, something the Chaturvedi Committee had also suggested. According to the 12th Plan, the existing CSSs will be restructured into three categories—flagship, major sub-sectoral and sector umbrella. The flagship schemes will get the maximum support, while the rest two will get funding to the level states find difficult to fund. In another major reform, and a long pending demand from states, from April this year the Centre will give states some degree of flexibility in managing CSSs. During the NDC meeting, chief ministers pushed for implementation of the Chaturvedi Committee’s recommendation to give states some autonomy to design and implement CSS according to state-specific needs. The 12th Plan has agreed to allow states to use up to 20 per cent of all Central scheme funds for projects designed by them. In addition, the rural development ministry has declared it will set up a Rs 40,000 crore Rural Development Flexi-fund for states to take up self-designed programmes. The Centre will contribute 70 per cent of this fund; states will shell out the rest. This is not for the first time NDC has debated pruning CSSs. NDC has discussed it in 14 of its meetings where chief ministers demanded changes in the increasing number of the CSSs, citing intrusion into states’ jurisdiction. In 1967, NDC formed a sub-committee on CSSs that recommended reduction in the number of Centre-assisted schemes to a minimum. After two decades, NDC again constituted a committee, headed by the then human resources minister PV Narasimha Rao, which recommended Central schemes not only be minimum but also their scope be limited to subjects having inter-region characters. The approval of the 12th Plan marks the end of two years of hectic efforts to make expansive and expensive rural development programmes effective (see ‘2011-12: revamp on the way’). First, the rural employment programme went through a change with amended rules and an expansion of permissible works under the Mahatma Gandhi National Rural Employment Guarantee Act. This also coincided with the government asking the Comptroller and Auditor General (CAG) to audit the programmes of ministries of rural development and drinking water supply and sanitation in the face of widespread corruption cases involving flagship programmes. CAG will audit programmes at the Central, state and panchayat levels. Second, a committee set up by the rural development ministry last year to restructure the District Rural Development Agency (DRDA) recommended its abolition. The committee finds that DRDA is in direct conflict with the Constitutional mandate for panchayats, which are increasingly being assigned the responsibility of implementing rural development programmes. Though a desirable move such decoupling of schemes will further aggravate the silo mentality that has become the hallmark of the Planning Commission. I can visualize the Ã”Ã‡Ã¿very visible hand of babudom using the shield of 14th Finance Commission to stall the move. For instance, internationally it is recognised that silos for grain storage in a marginal small farmer dominated economic landscape have proved to be rusting monument to bad planning Planning Commission is complicit with agriculture ministry and egging on the food ministry to go high on PEGS. Similarly, the template of RKVY the flagship programme for agriculture that required states to tailor make an appropriate district agriculture plan, in a delicious irony builds on the marginal-small farmers as a major weakness that needs to be surgically removed. PM in his NDC inaugural speech on 27 December 2012 alluded to it Ã”Ã‡Â£move people out of agriculture by giving them gainful employment in the non agricultural sectorÃ”Ã‡Ã˜. The slim and trim move as described is designed to fail. The Ã”Ã‡Ã¿trickle downÃ”Ã‡Ã– approach surely has not worked nor has the bottom of the pyramid up approach allowed a natural growth pangs. Experience with 243ZD is contemporary history. The primacy to self-governing institutions needs immediate reckoning to save the rural economy and thus secure the rural livelihood.